White Oaks has been a Westlake institution since the 1920s. It is a very throwback restaurant with a country club vibe. During prohibition, it was a speakeasy catering to the crème de la crème, and it honors that rich history with its decor and food. The interior is split up into a honeycomb of many small rooms covered in dark wood and rich colors with fireplaces spread throughout the restaurant. I felt like I had stepped back in time. In fact, we had. I think we were the youngest table there, but that didn’t stop us from enjoying our meals. White Oaks features old-school fine dining, with entrees such as Beef Wellington, Veal Oscar (which was a special that night) and venison. I learned later that it was my parents’ special occasion restaurant in the 1970s and 80s when I was growing up in Olmsted Falls. I apologize in advance for the darkness of the photos. I didn’t want to use the flash on my phone and disturb the other diners. Plus, there is a sign discouraging the use of cell phones, and I didn’t want to be chastised. 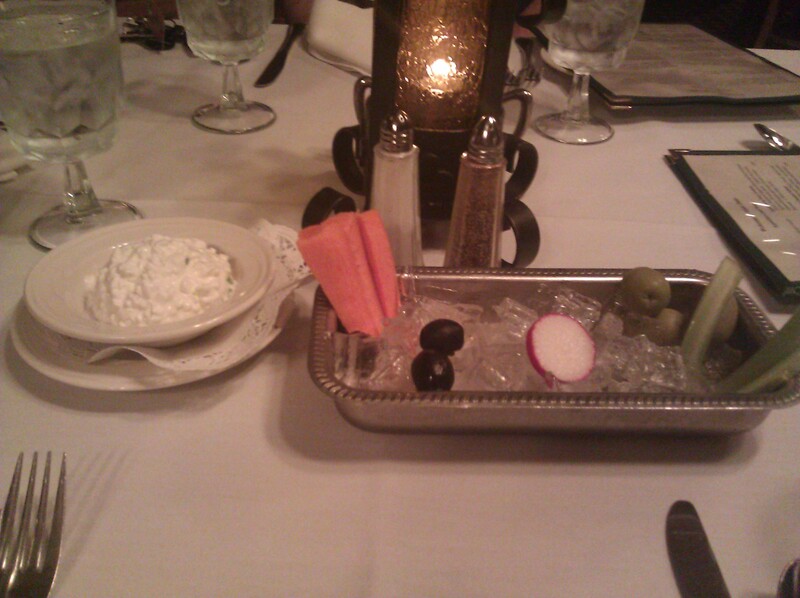 Every table is served house-made cottage cheese and a relish tray featuring carrot and celery sticks, a couple radish slices, and green and black olives. I found this very quirky, but loved the cottage cheese, which is flavored with fresh chives. It was definitely unique. I love cottage cheese (especially Breakstone Cottage Cheese) and could have eaten the scoop of cottage cheese all by myself if given the opportunity. I started with the Apple Onion Soup Gratinee, which features “slowly simmered Spanish onions and Red Delicious apples in a flavorful broth. Topped with freshly grated Mozzarella and Swiss cheeses golden-browned”. 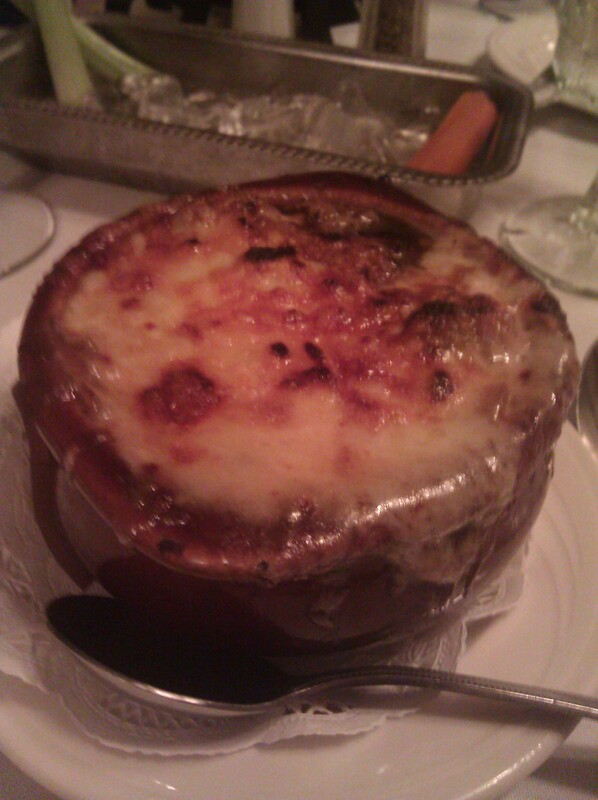 I love French onion soup, and the addition of apples was an inspired choice. This soup was absolutely delicious and piping hot with all kinds of melty cheese. I was in heaven. I wasn’t as enthralled with the bite of escargot, but having had excellent escargot in France I am spoiled. It was good, but not spectacular. My friend, however, enjoyed it very much. Next time I will try the highly recommended Pale Ale White Cheddar Cheese Fondue, but I may just have to order the soup again. It was *that* good! The salads were good, but not anything that stands out. My friends ordered blue cheese dressing and ended up paying a$1.50 upcharge for it, which I don’t remember the waitress mentioning when they ordered it. They enjoyed the fresh salad dressing with crumbled blue cheese and didn’t mention it when we were settling the bill. Word of warning: they put our four meals all on one bill. Apparently they don’t do separate checks even when asked. We could pay with separate credit cards, but we had to tally the bills up ourselves. I ordered the Venison au Poivre for my entree. It was not at all gamey and was marinated in a ruby red port with assorted seasonings and juniper berries and topped with a port cranberry game sauce. I requested the twice-baked potato instead of the rice. 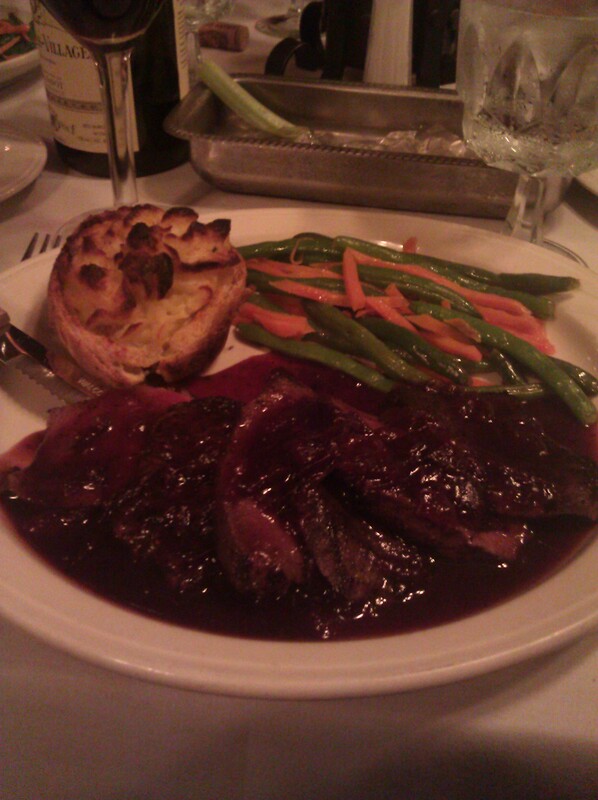 The venison was perfectly cooked and I loved the sauce. The twice-baked potato was a little drier than I would have liked, but was good. The entree came with haricot verts and julienned carrots. 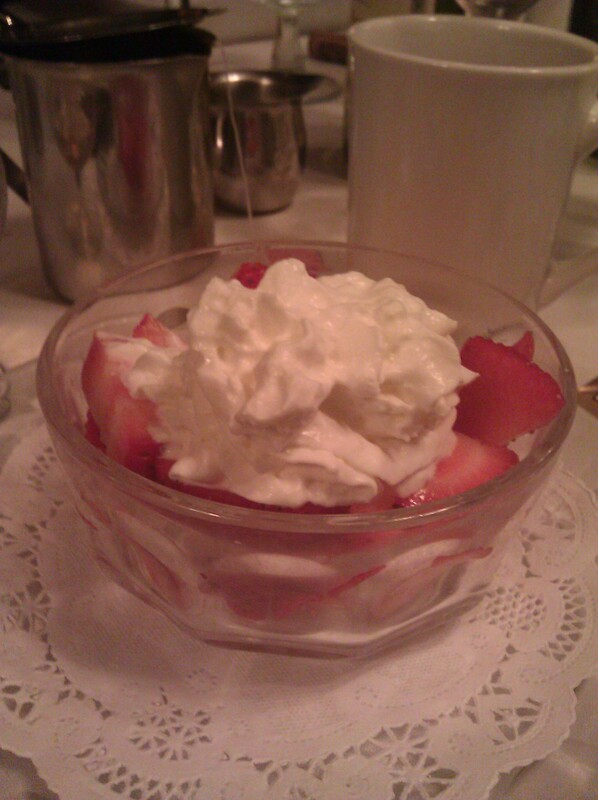 For dessert I ordered tea and a simple order of fresh strawberries topped with a splash of Grand Marnier and fresh whipped cream. I chose a nice Orange Pekoe from their selection of tea bags. The strawberries were fresh despite not being in season any more. The dessert course was simple, yet perfect. My friends loved their meals as well, ordering the Beef Wellington, the Veal Oscar and the Filet Mignon with Gorgonzola. The service was attentive but not overbearing, and our water glasses were constantly topped off. 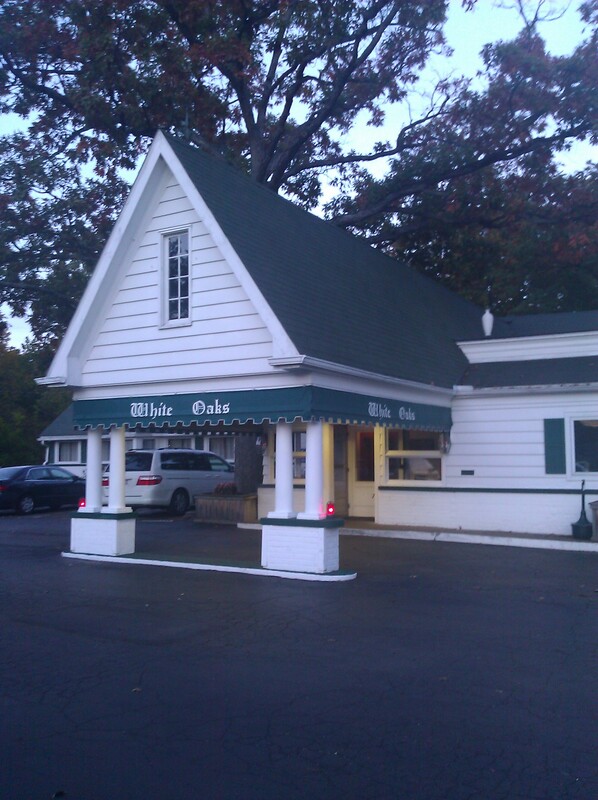 If you are looking for a restaurant with old-fashioned flair give White Oaks a try. I hear it is sumptuous in the winter with the fireplaces burning and reflecting off the polished wood. That was a total coincidence, but you’re right. It was perfectly timed.